At this step, you can run PEST Check and start/stop the PEST run. Before launching the PEST run, it is a good idea to run PEST Check. 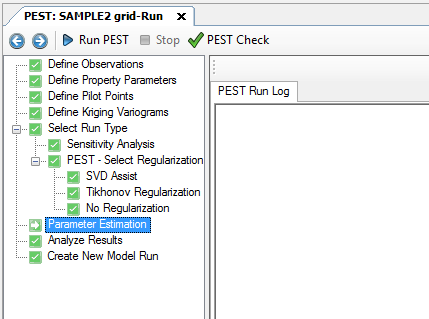 This PEST utility will check all the input files to ensure they meet a minimum set of criteria. Click the Run PEST button to start the pest.exe. The progress should appear in a DOS window. 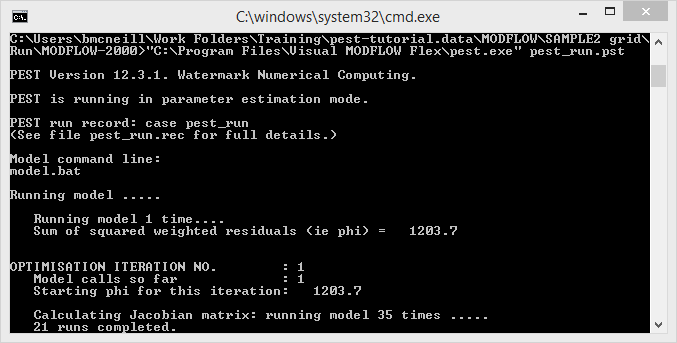 Once PEST finishes, you should see a confirmation message appear under the PEST Run Log tab, indicating if the PEST run was successful or not. Click (Next Step) to proceed to the Analyze Results step.